Now my first reaction to this was “WHAT THE HELL IS THIS!!! !”, looks like some one has hacked the google.com!!!! Though that is not possible even in your fictious dreams. So i was taken aback for a moment, then with a chillax i was observing at the logo as i am sure as usual these guys(Google) are playing with their logo to track more attention. Yup so that is what they have done. My low IQ could not get to what exactly its all about. 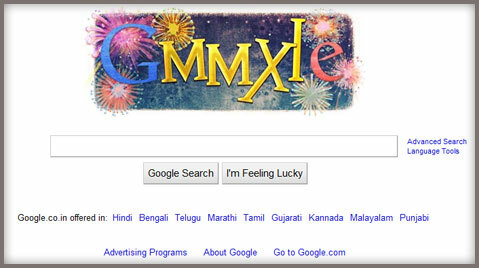 Now so i got to know through the online sources, that the “GMMXLE” was a peculiar way of Google welcoming the new year 2011. Why “GMMXLE”? Look out, here between G and E, we have XXLE which in roman does refers to 2011. That is awesome 🙂 is it not?? Have you ever spent more than a minute on google home page?? Majority of them might only say – “NAA”.. SO these guys put in their creativity with some gray cells and just make people to stay on and make you feel that, “Google” is the internet giant. Amazing way, is n’t it? I just loved the way the guys have shown up and have caught plenty of attention compared all the previous attempts.